Oh look, it’s not just me in my blog today! *laughs* I coerced my dear husband to pose with me since he’s sporting something new from FATEwear! We have trouble finding clothes for Aldwyn a lot of the time. He’s just a regular ol’ guy and likes regular ol’ guy clothes. So many times, what we see is just not his style at ALL. Luckily, we never have a problem at FATEwear! He’s wearing one of the new Robertson sweaters today, and I like it a lot. [Because what I think is really the most important part of it all, right?] I really like turtlenecks on men, so this is definitely a fall fave for me. 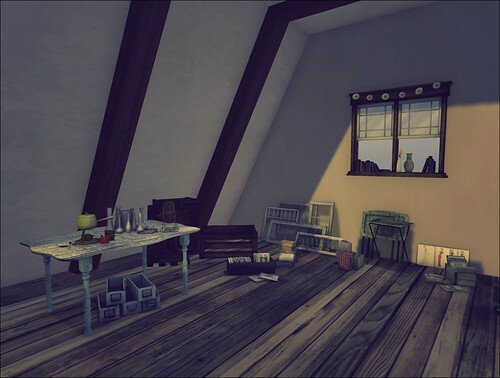 My Attic is still going on and I’m wearing one of the Color Striped dresses by Stellar that you can find out at the event. There is matching nail polish for the different colors of the dresses, too! Do you have stores where no matter what they release or how often they release, you get totally excited? Coldlogic and Truth are those stores for me! Coldlogic just did a big fall release and I am so here for it! I was wearing the new Caron cropped sweater last night and my husband immediately told me how cute it was. It’s a winner! I didn’t think I was going to like the new Leck pants because of the tiny ankles, but once I put them on, I realized how adorable they really are. The whole release is really cute, so you need to check it out. Truth released Shae recently and it’s the hair I needed in my life. Truth does amazing braids anyway, but this big fluffy side braid is so so gorgeous, I can’t get enough of it. I hope fall is treating all of you well! A couple of days ago as I was logging in, I noticed on the Firestorm login screen they were promoting A Clockwork Spiral. It’s a steampunk themed charity event benefiting the National Kidney Foundation. 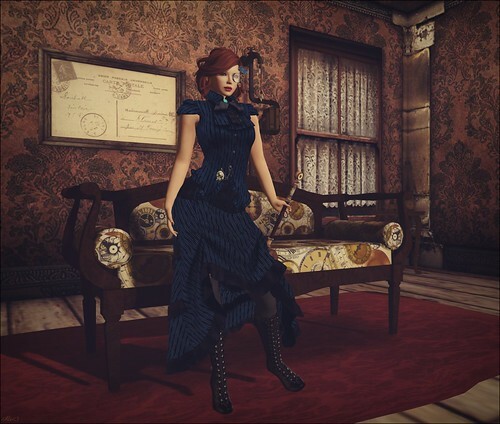 I was intrigued because in my many years in SL, I have always been fascinated by the steampunk genre, although I know very little about it. My darling husband and I went out there last night and he treated me to a couple of things I just have to blog! The cool thing about this event is that I got to see stores that I’d never heard of before, like Kita’s Sideshow. The Inventor’s Daughter is such a classy dress! Actually, it’s two pieces, so you could wear the skirt and shirt separately. I love it! NanTra poses is also out at ACS with the Dozer’s Divan. There are 10 poses in it, and 5 textures to choose from. Plus for a couple of the poses, you get to hold a cane, and it came with the cool little monocle that I’m wearing. And check out my cool watch! 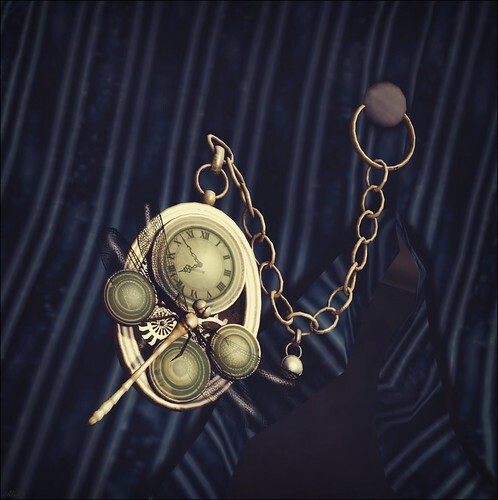 The Mechanika fob watch by Eclectica is probably my new favorite thing! You all know how much I adore dragonflies, so this makes my heart happy. It actually tells time [you can set the time zone] and the gears move! A Clockwork Spiral runs until October 1st, so head on over and get some pretties! FaMESHed really has been spectacular this month, and I am loving the Tie Dye Tanks and Sparta leather pants by Cracked Mirror! I feel like if you go out to clubs or out dancing a lot, you’ll make a splash out on the dance floor in this outfit! Truth released a couple of new hairs recently, and Cameo is a great party hair! It’s very full and if you use one of the dipped colors, you get that extra bit of “rockstar” to your look. My Attic opens up on the 21st and L.Warwick will be there with the new Elation heels. I love love the retro feel of these, along with the awesome textures! They’re for the Slink medium feet, and there is also a pair to fit the upcoming Belleza mesh body. I’m not really the dressy type these days. You’re much more likely to find me in jeans and flats. But once in a while, my “fancy” comes out! The Liaison Collaborative is OPEN and how fab is the Narcissist dress by Valentina E?? It comes in two options, one with the closed high front [which I’m wearing because I’m a lady] and one with the open front to show off plenty of cleavage. Both have the low open back. The jeweled necklace comes with a texture change option, as well. Collabor88 is going strong and you have to check out the new Gloria heels by Fri.day! These shoes are for the Slink high feet, and they are indeed high! The heel is super tall and the glittery strap snakes up your foot in a flattering way. You neeeed these heels in your life. Oh, do you like my little bird friends? They’re out at TLC this month from Half+Deer! They’re from The Mad Scientist’s Bird and Cage set. The little metal birds’ eyes pulsate and glow, but it’s not distracting at all. So this tiny little event started this week. I don’t know if you’ve heard of it. I believe it’s called… THE ARCADE. Okay, so you basically have to be living under the biggest rock in the deepest cave in the most remote part of Antarctica to not know about The Arcade! Second Spaces is out there with the cuuuutest decor set! 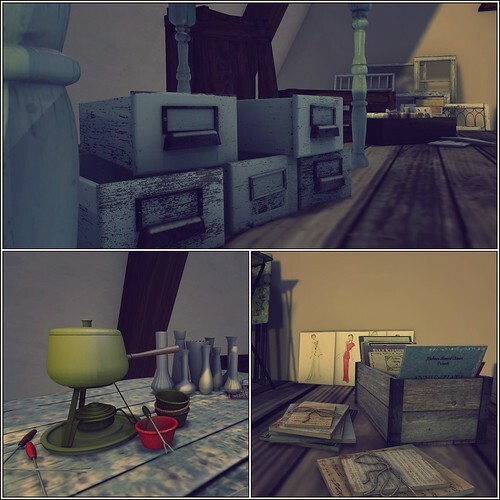 It’s called Flea Market Finds, but I thought it looked like stuff you might find in the attic of your grandma’s house! There are 11 pieces to collect, 2 rares [the bingo set and the cigar boxes], and it’s $75L a play. 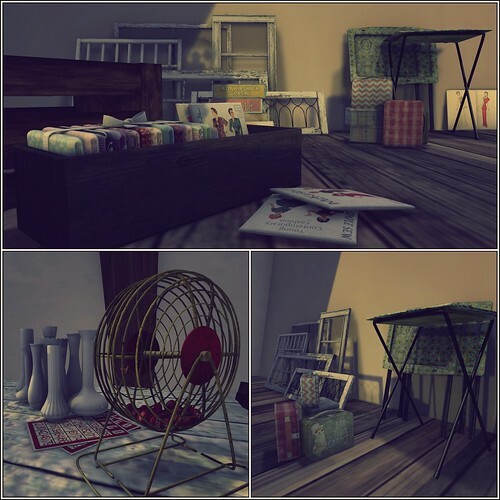 Second Spaces is my favorite place for “clutter” stuff in SL, and I know I’ll find places in my house for every single piece of this set.